Have you ever felt despair with the way the world is? Ever felt so tiny that just the small things you do don’t matter and won’t change the world? You know your not alone? So many people feel this way, me included. That’s why I want to share my mantra with you. The one thing that really helps me. 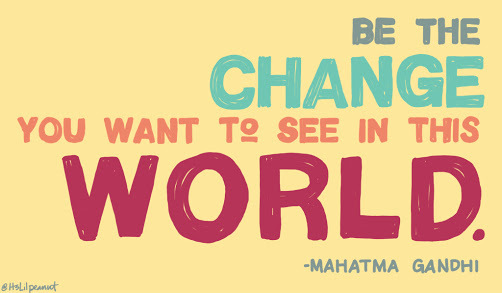 Be the change you want to see in the world. It’s from Gandhi. I love this. Just think if we all just did one small nice thing each day how nicer the world would be. One of mine was a few days back when I picked up a dead cat off the road and laid it on the side of the road near a tree and used social media to help find its owners. Some others are just as simple as allowing someone out of a car space even though I don’t need the space. ← Inspirational Blogs and Designers I love! !